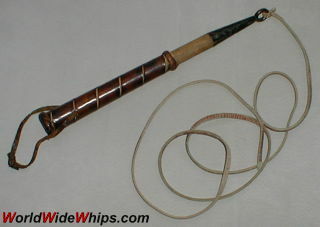 A strange item is this one, sold to me as a mule whip, said to come from somewhere in southeast Europe. The tapered wooden handle is half wrapped with leather, both ends of the wrapping decorated with Spanish rings. The handle is enforced with an iron cone, topped by a ring which holds the thong (a single untapered strip of leather). The handle´s wrapping dried out, so the wood became visible between the spirals. The handle seems to be made for a whip far stronger than that simple strip.